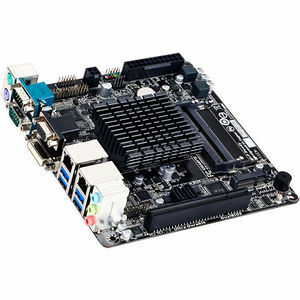 The GIGABYTE J1900N Mini-ITX motherboard is a fully integrated PC motherboard featuring the Intel® Celeron™ J1900 quad-core processor. Designed for compact, small form factor PC systems and devices, the GIGABYTE J1900N is entirely fanless, making it ideal for always-on, mission critical systems, as well as noise-sensitive digital entertainment systems. Connectivity includes digital and analog display outputs via DVI-D and VGA ports, while a Mini PCI-E slot provides flexible Wi-Fi option and a PCI slot provides wide-range expansion card selections. The Intel® Celeron™ J1900 Quad-Core processor is the latest system on chip (SoC) from Intel, combining CPU, graphics and memory controller in one package. Based on the 22nm manufacturing process, the Intel® Celeron™ J1900 uses the smallest package of any desktop processor within a low thermal envelope of on 10 watts. The Intel® Celeron™ J1900 boasts excellent performance including DX11 gaming on Intel® HD Graphics, plus a dedicated H.264 encoder for smooth HD video playback. GIGABYTE Bay Trail-D Series motherboards raise the bar in terms of protecting your system, providing advanced electrostatic discharge (ESD) protection for both your Ethernet LAN and USB ports, both common sources of ESD-related failures. Each LAN and USB port is paired with a dedicated protection filter that can withstand high electrostatic discharges, protecting your system from common electrical surges and even direct lighting strikes.